These plastic bins come in a wide variety of sizes to optimize storage space on the metal shelves, multiplying functionality as they help classify small-sized items. Vertical dividers can also be incorporated, allowing various products to be placed in the same container. These plastic bins include on its frontal, most visible part a specific slot to put labels or barcodes, assisting in the identification of the content and the rapid location of items. This feature is especially useful when the bins are integrated into metal warehouse shelving, facilitating picking tasks and the handling of products. 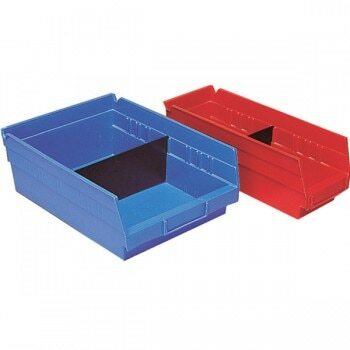 They are available in sets of 6 to 36 bins, depending on the size selected. Optional items that provide great practicality to metal shelves. Molded out of durable polypropylene for years of service. They can include cross-ways dividers to partition bins and maximize space. If color not selected, blue is sent.